Gradually coming into focus is the plain fact that today we have two universities — the traditional university, which, while mostly left-liberal, still resides on Planet Earth, and the grievance university, mired in the morass of postmodern obsession with oppression and privilege. You can still get a decent education, even from very liberal professors — I had several excellent ones as both an undergraduate and a graduate student — if they teach the subject matter reasonably, and I came to respect several far-left professors at Boulder who plainly held to traditional views about the importance of reason, objectivity, and truth. But these traditional hallmarks of the university — one might call them the original holy trinity of higher education — are fighting words to the postmodern Left, which openly rejects reason, objectivity, and truth as tools of oppression. .... You could argue with a Marxist. 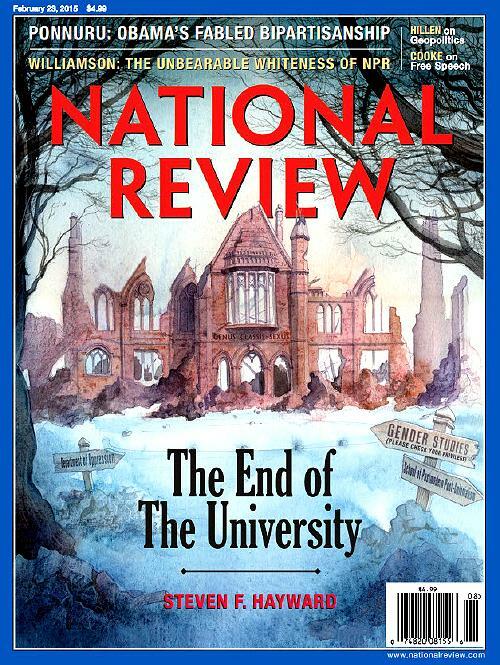 Today’s ruling campus leftist ideology is indistinguishable from nihilism and rejects any consideration of nature as the ground of anything. In fact, invoking human nature is one of the surest ways of calling down ferocious denunciation from the campus Left.